Today Tom shows off a wheel for your 1955-1957 Chevy that allows both large and dog dish style of hubcaps! FINALLY! 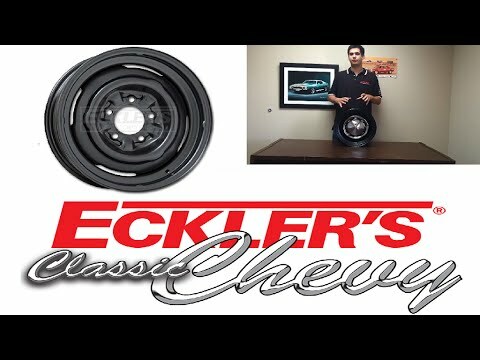 Eckler’s Classic Chevy has a wheel that looks like and OE steel wheel and allows you use your stock original hubcaps with a standard disc brake conversion. Many Bel Air, 150, 210 Nomad or wagon owners would love to have the safety of disc brakes but did not want to lose their factory full wheel, dog dish or police style center caps. Not a problem any longer with this Factory style wheel which is available in several backspaces from Ecklers Classic Chevy. Trust Ecklers Classic Chevy for all your Tri-5 parts needs always at the best possible price. NOTE: Please know the backspacing and size you need before you place your order. Wheels which have been painted or had tires mounted will not be acceptable for return. and dog dish style of hubcaps!